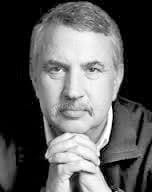 Norwich University will present Thomas Friedman, internationally renowned author, reporter, columnist and Pulitzer Prize recipient in the second event in this year’s Fall Todd Lecture Series on Tuesday, Nov. 5, at 7pm in Plumley Armory. An author of five bestsellers, Friedman will discuss the book he recently co-authored with Michael Mandelbaum, That Used to Be Us: How America Fell Behind in the World It Invented and How We Can Come Back. The book theorizes that Americans need to study harder, save more, spend less, invest wisely, and get back to the formula that made the United States successful. Friedman will analyze the four major challenges we face as a country – globalization, the revolution in information technology, chronic deficits, and our pattern of energy consumption – and spell out what we need to do now to preserve American power in the world. Friedman will also show how history provides the key to rediscovering the importance of valuable traditions. The Todd Lecture Series is named in honor of Army Maj. Gen. Russell Todd (USA Ret.) and his wife, Carol, in gratitude for their dedicated service to the university. Todd, ’50, serves as Norwich President Emeritus. With this series, Norwich brings significant lecturers to campus. All events are free and open to the public.